These brightly coloured Anodised Aluminium Tags and Discs are of superb quality and are available in a selection of exciting colours. They are ideal for use with both Laser and Rotary engraving. 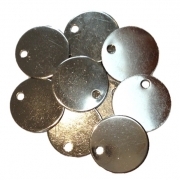 Our range includes GI Tags, Discs and Novelty Pet Tags.